In a big action campaign, students worldwide turned the spotlight on shortcomings of the global R&D system. With the second edition of its Access to Medicines Week, UAEM called on the scientific community in an open letter to support a global research agreement. The launch of this campaign was accompanied by panel debates, film screenings, die-ins and the first presentation of the “Medicines for People Award”. Each year an estimated 200,000 people die of multi-drug resistant tuberculosis (MDR-TB), mostly in low-resource settings. Only about a fourth of half a million patients that get MDR-TB annually have access to the available treatment, which causes severe side effects. In India alone, approximately 64,000 people develop MDR-TB annually. Meanwhile, in many European cities, thousands of Hepatitis C patients have taken the streets, demanding access to a new generation of drugs. These are sold for US$1,000 per pill for treatment, yet cost a fraction of that—only US$1!—to produce. Two populations in different continents, but with a struggle in common: the development of treatments that could save these patients’ lives depends on a system which has been designed to maximise industry profits and not to save patients’ lives. Universities Allied Essential Medicines (UAEM), an international student organization, has long spoken against this inequity in access to lifesaving medicines and is outraged by the fact that the current R&D system enables such atrocities to happen. The 2014 Ebola crisis, rising antimicrobial resistance, and a dry pipeline of innovative drugs to treat diseases such as MDR-TB have highlighted the urgent need for an R&D system that addresses global health needs. With World Health Organization (WHO) member states holding an open-ended meeting to discuss a global R&D agreement in March 2016, UAEM is now taking action to push forward the change that is urgently needed. 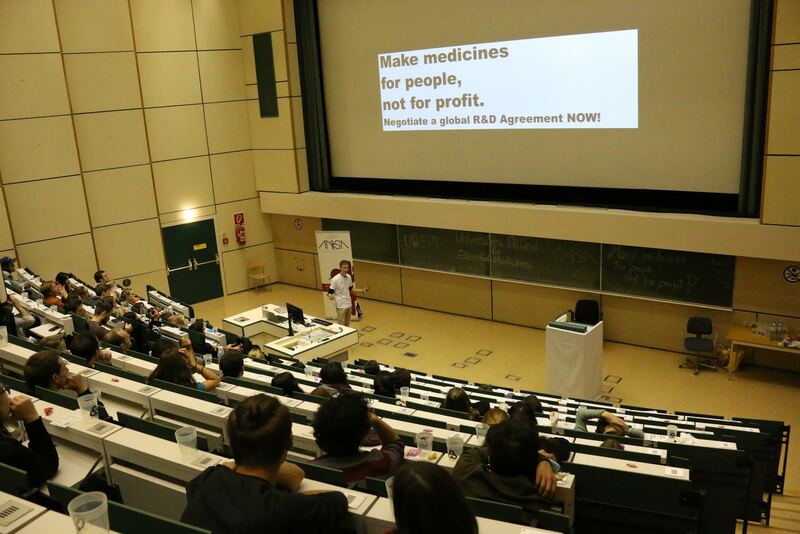 In their second international Access to Medicines Week (November 2-8, 2015) UAEM has launched its global campaign urging WHO member states to negotiate a global R&D agreement. This agreement should promote sustainable mechanisms for financing R&D beyond price-inflating intellectual property monopolies and would be guided by public health needs instead of profits. The agreement should encourage knowledge sharing in an open-access research scheme in order to efficiently bundle innovation for diseases that disproportionally affect poor or neglected populations. The upcoming open-ended meeting on an R&D agreement has been preceded by over a decade of negotiations. In 2012, after years of intense negotiations at the World Health Organization (WHO), the Consultative Expert Working Group on R&D (CEWG) proposed an R&D agreement as a way to truly address the increasingly evident global access and innovation crises. Since 2012, CEWG discussions have been stalled, and the lives of many patients have been needlessly lost. The Ebola epidemic has highlighted the lethal consequences of this inactivity: potential vaccines and treatments remained in preclinical development for over a decade prior to the outbreak. Our market-driven R&D system did not provide sufficient incentives to invest in treatments for this disease which was thought to be limited to poor countries. The lack of a global, binding R&D agreement has resulted in a myriad of ad hoc interventions by governments, institutions and organizations to palliate the existing access and innovation problems. A global R&D agreement is necessary to concert the fragmented actor landscape. 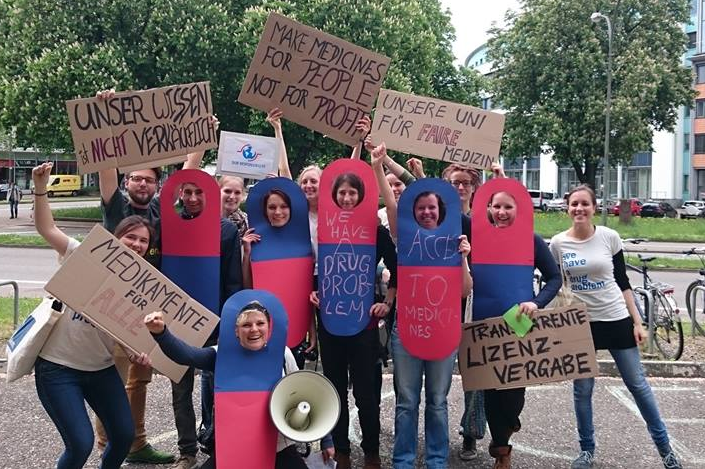 UAEM groups at around 100 universities around the globe have called for a more equitable global R&D system during Access to Medicines week, urging academics, doctors, public health professionals and others to join in the movement. Members of civil society and organisations such as Médecins Sans Frontières, StopAIDS and DNDi have already joined this movement. This past week, Nobel Laureates Joseph Stiglitz and Sir John Sulston, together with many other scientists, researchers, doctors, professors and students from around the globe, have signed UAEM’s letter urging WHO member states to move forward with the negotiations of a global R&D agreement in 2016. In its first week, the letter has gathered nearly 1,000 signatures. The launch of the R&D campaign during Access to Medicines week has shed light on the current status of biomedical research and development through debates, round tables, street actions and film screenings in major cities and universities worldwide, from Berkeley to Boston, from Canada to Brazil, in Hong Kong and across Europe. 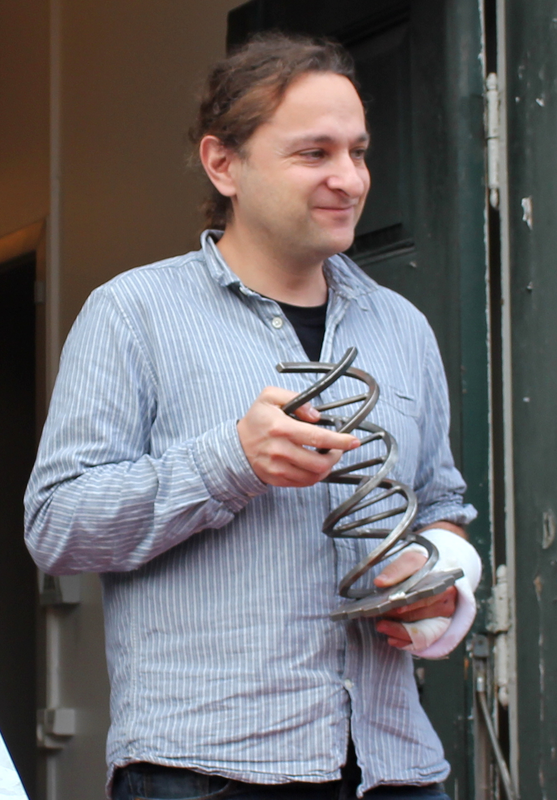 The University of Copenhagen’s activities stand amongst the most creative actions: the first “Medicines for People” Award was granted to Professor Ali Salanti for his malaria research embracing the values of responsible R&D. 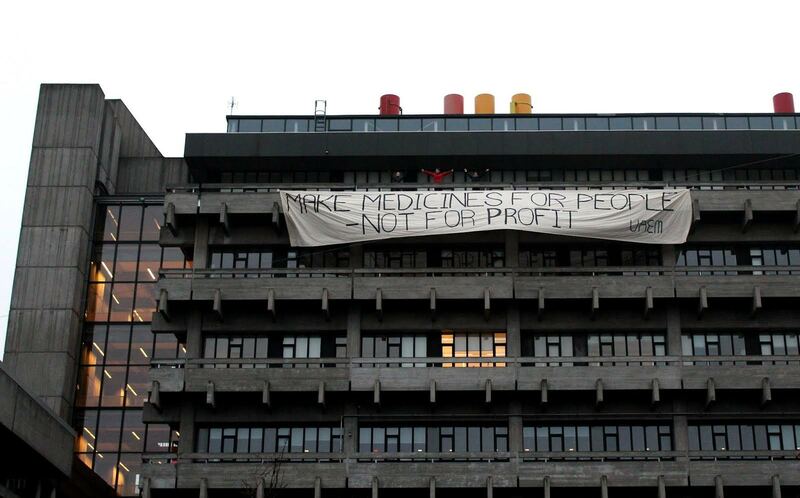 A huge banner reading “Make medicines for people not for profit” hung for hours on the facade of a university building. Their discourse was even featured by the Danish National Television. At Central Michigan University, UAEM students held a “die-in” protest on campus. Their demand for an R&D system that addresses global health needs and not shareholder value was covered by local media stations. The lively debates held at universities this week are only the starting point of the campaign: On the 26th of November, politicians from the Netherlands will meet with UAEM, MSF, HAI and DNDi in The Hague to present their stance on the R&D agreement. Continuative discussions between academia, doctors and national politicians aim at leveraging countries’ representatives for their support of the negotiations on the R&D agreement in the WHO open-ended meeting in March 2016. Join UAEM in urging WHO Member States to proceed in negotiations about a global R&D agreement with our sign-on letter for academics. This is UAEM’s first campaign directed towards national health ministers and WHO negotiators around the globe. UAEM is a global movement of university students which started at Yale University in 2001 (Read more about UAEM’s history). As part of its advocacy for an equitable research system that meets global needs, UAEM also tries to change norms and practices around academic technology transfer and empowers students to respond to the access and innovation crisis. UAEM criticizes that universities increasingly put profits over the public good when it comes to commercializing their discoveries. As further countries (e.g. India with its new IP policy) are moving towards a system that promotes technology transfer via patents, UAEM tries to mitigate unaffordable drug prices by urging universities to adopt socially responsible licensing (SRL) schemes. The movement did already achieve some success: so far, 37 North American and 10 European universities have introduced SRL in their technology transfer policies.